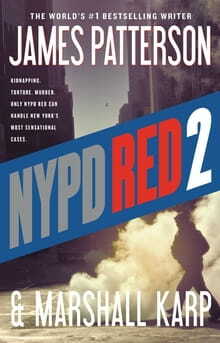 NYPD Red 2– the second installment of James Patterson & Marshall Karp’s series of crime procedurals highlighting a fictitious police task force specializing in cases touching the rich and privileged in the Big Apple – is a novel in the general sense that, say, a Pacer is considered an automobile. Technically, it’s more of a book of length that reads like a fleshed-out screenplay for a cop movie. The characters are more like types, and even the aspect of the book which should be its strong point – the plot – feels warmed-over and in no way full of the twists or shocking reveals which thrillers should feature. In short, there’s little about this book that makes itworth favoring over the dozens of other mass-market selections at your e-tailer of choice. Partners Zach Jordan and Kylie MacDonald - introduced in the first installment in this series, 2012’s NYPD Red - take on the case of the murder of Evelyn Parker-Steele, a well-connected NYC woman who is also the campaign manager for mayoral candidate Muriel Sykes, a few weeks before the election. Based on the victim’s attire at time of discovery – a white Tyvek jumpsuit – Jordan and MacDonald instantly link the murder to a string of four other murders by a serial killer known as the Hazmat Killer. While there’s no common thread linking Parker-Steele to the other victims, Jordan and MacDonald determine the Hazmat Killer chooses his/her victims based on crimes they committed which went unprosecuted, choosing to kill them after torturing them and videotaping a forced confession. Sort of a vigilante killer with a flair for the dramatic. Intersecting with the Red crew’s investigation is the story of a pair of friends Gideon and Dave, who as teenagers secretly murdered Enzo Salvi, the son of Mafia boss Joe Salvi, as payback for an assault on Gideon’s sister Meredith. Introduced as a tantalizingly unrelated prologue to the book, the story of Gideon, Dave, and the buried-secret-that-doesn’t-stay-buried manages to creep into the Hazmat Killer investigation at an opportune moment. Karp – the author of several successful crime thrillers in his own right before taking on quasi-ghost-writing duties with Patterson – obviously has the knack for banter and cop jargon required for zipping through a ride-along style novel like this. Most of the novel features the narrative voice of Jordan whose wisecracking observations on his duties catering to the crimes of NYC’s rich and famous strikes an appealing blend of technically qualified and self-deprecating. Unfortunately, Jordan is hopelessly shallow and vapid, spending nearly as much time lusting over his therapist girlfriend Cheryl as working on cracking the case. As crime thrillers go, there are far more engaging reads around. They’re the literary equivalent of junk food - brilliantly marketed, hastily consumed, and instantly forgotten. A minute on the lips, a lifetime on the hips, the saying goes. Fortunately, there’s no comparable experience when reading. Once gone, this will surely not stick with anyone. Though publishers keep churning out these blue plate specials for the masses, one glance at the type of nuanced crime shows burning up TV sets these days – HBO’s True Detective comes to mind – shows how far short this book falls. Karp and Patterson will have to work harder next time around to craft a procedural that does more than stay glued to the lowest common denominator of sketch-vague stereotypes and glib, shallow banter.